When Ethan was younger, I taught him to read using the whole word approach. Here’s a video of him reading at 16 months old. And here is a video of him reading at 20 months old. Now that he’s over 3 years old, I introduced reading the phonetic way. I don’t usually use phonics to teach kids below 5 years old as I find it too confusing but one fine day when I was coaching a 7 year old girl to read, Ethan repeated after her and I realised that he is picking up fast on phonics. I tested him and well enough, he is coping well. We use ‘e-Xra’ (eclectic – Express reading approach) and I highly recommend this book! Watch this video and you can see what it is like during any one of our reading sessions..
Watch the video above. You will see that he got distracted by the box of colour pencils. If you encounter distractions during reading time, simply remove the object of distraction and continue reading. You’ll also notice that he had trouble with ‘bug’ and instead of telling him the word, I got him to sound it out to learn the word. Since the publication of this entry, I’ve received numerous emails on where to get the e-xra books from. Bet he can read very well now. Good boy, Ethan! yay, I managed to locate this book already! thanks for your recommendation. Tekkaus.. it's not expensive.. really! Your boy have all the motherly attention that he needs.. so good for him! he sure grows up smart and intelligent! Wow that is so impressive! Aww looking at his first video is so cute! Ethan still in diapers!! Good boy, he can read so well. Way to go, Merryn! I read that teaching a child to read should be teaching him to read words (like what you are doing) instead of reading letters. Many people use the Ladybird series of books and their cue-cards. Thanks for stopping by. So nice of you to share your method to teach Ethan. He is certainly a genius.. thanks to mommy! 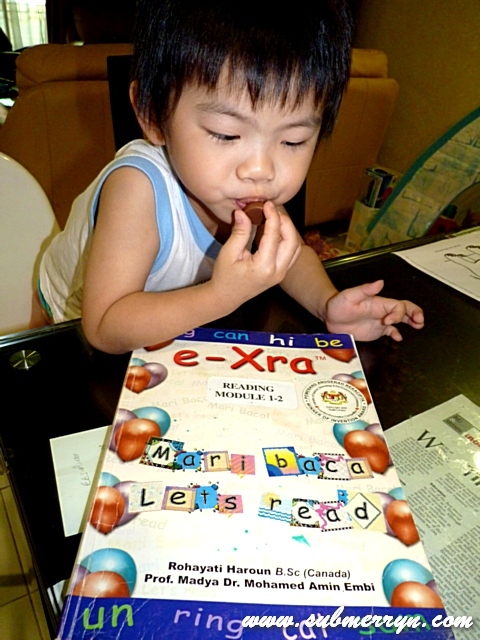 wah…your boy can read soooo well at such young age. U done so much for Ethan !